Circus West Village, London’s newest neighbourhood at the foot of the Power Station, offers plenty to do for adults and children alike and will be kicking off the festivities next weekend, Saturday 1stand Sunday 2nd December, with carolling, workshops, delicious food and drinks and a Christmas tree with a difference. 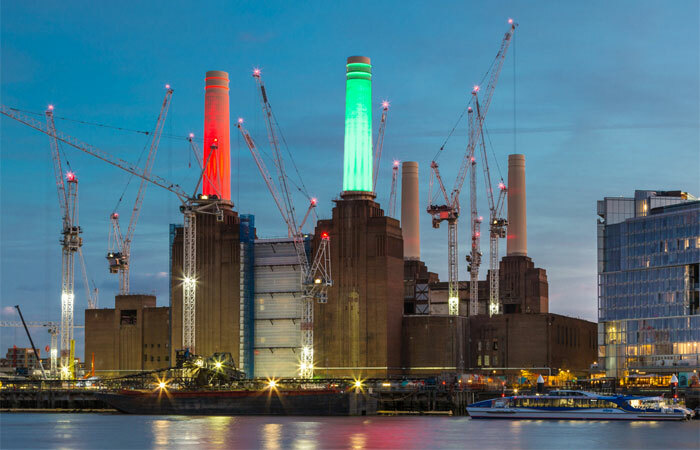 Battersea Power Station’s Light Up Winter initiative, which will extend into January, includes Christmas wreath making and candle making workshops, as well as a play by Michael Morpurgo, the creator of War Horse, entitled Mimi and the Mountain Dragon. This family theatre show is full of adventure, snow, dragons, lively songs and magical puppets. Performances take place in The Village Hall at Circus West Village on select dates between 22nd and 31st December from 11am – 4pm. To buy tickets and view the full winter programme visit batterseapowerstation.co.uk/winter. An interactive Christmas tree installation reaching over 7m in height that allows visitors to trigger an animated light show will be bringing a splash of light and colour to the riverwalk at Circus West Village. The structure has been designed to allow people to explore underneath it, revealing a more immersive and interactive spider-web shape. The tree is the first installation in the UK to come from Paris-based Studio Bruyant. The workshops will be taking place in the Circus West Pop-Ups and include a Christmas wreath making class from florist Moyses Stevens, which will soon be opening a boutique and floristry school at Circus West Village. Using a pre-made wreath base, the florists will demonstrate how to build in additional foliage and add a variety of seasonal decorations to complete a beautiful Christmas wreath. The workshops will take place on Saturday 1st and Sunday 2nd December at 11am and 2pm. Please note these classes are suitable for adults only. Another will teach both adults and children how to make their own holiday candles. Adults will be able to choose from an array of seasonal fragrances and dyes while children will be able to decorate their candles with colourful packaging and gems to personalise each one. The adult workshop takes place on Thursday 29th November at 19.00 and the children’s sessions will take place on Sunday 16th December at 10am, 11am, 1pm and 2pm. Paint Jam, taking place on Friday 30th November, offers a quirky night out to get you in the festive party mood, in a pop-up art studio offering a social painting workshop with a bar, DJ and free mince pie for everyone. Those taking part get to paint their own canvas, get creative, mingle and go home with an original artwork. There will also be live music every Thursday and Friday evening and Saturday and Sunday afternoons from the end of November to the middle of January, with a range of soloists and duos playing their best upbeat tunes under Grosvenor Arch and on the Piazza. The initiative is from Busk in London, which supports and champions street performance across the capital. Next Is social media taking over your life?